The Barnett/Ziegler/Byleen/Sobecki College Algebra series is designed to give students a solid grounding in pre-calculus topics in a user-friendly manner. The series emphasizes computational skills, ideas, and problem solving rather than theory. Explore/Discuss boxes integrated throughout each text encourage students to think critically about mathematical concepts. All worked examples are followed by Matched Problems that reinforce the concepts being taught. 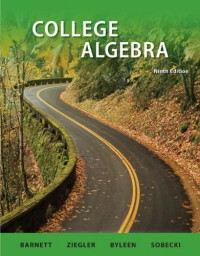 New to these editions, Technology Connections illustrate how concepts that were previously explained in an algebraic context may also be solved using a graphing calculator. Students are always shown the underlying algebraic methods first so that they do not become calculator-dependent. In addition, each text in the series contains an abundance of exercises - including numerous calculator-based and reasoning and writing exercises - and a wide variety of real-world applications illustrating how math is useful.